Aah chocolate – that beautiful gift from the bean of the Theobroma cacao plant. Chocolate has been around for a very long time, but not as we currently know it. Evidence shows that the cacao bean could have been fermented and made into an alcoholic drink in Central America as early as 1400 BC! The Mayans seasoned their chocolate, mixing the roasted seed paste with water, chilli and cornmeal, transferring the thick, unsweetened gruel-like mixture between earthenware containers several times until a foamy drink formed. The Mayans loved their chocolate and the cacao bean was traded as currency. It caught the eye of explorer Christopher Columbus in 1502, and he brought some back to Spain with him. A few years later when the chilli was replaced with sugar the cacao drink gained popularity in European courts. The rest is history. The very first Thorntons chocolatier opened its doors in 1911 in Sheffield. Travelling confectioner Joesph William Thornton handed the keys to his sons Norman and Stanley and said, “Make this the best sweet shop in town!” They’ve done a rather good job at that! Now, over 100 years later Thorntons is seen by the British public as the ultimate chocolate treat on the high street, with over 600 stores across the UK. There’s even one here in Shetland! Everyone has their favourite Thorntons chocolate – what’s yours? Brits consume a whopping 660, 900 kg per year in a UK industry worth £3.96 billion (Mintel 2012). 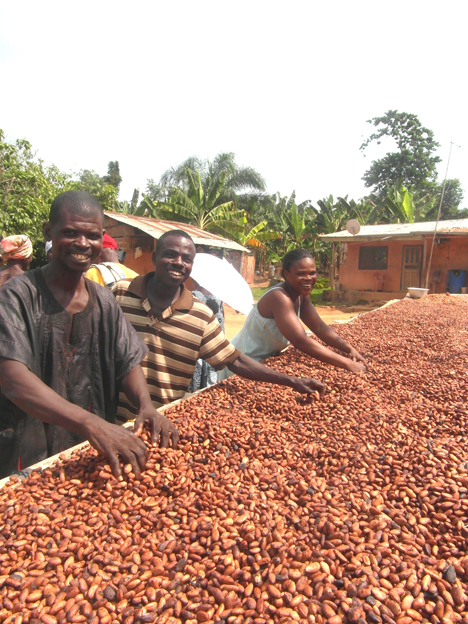 Demand for chocolate in the west has caused some cocoa farmers to resort slavery and child labour to cut costs and remain viable in what can be a very volatile market. These practises have featured in the news over the last decade or so and have driven consumer buying choices. Thorntons has a strong corporate social responsibility policy, sourcing sustainable, ethically produced raw materials for their high quality products. They provide a range of organic, fairtrade and no added sugar ranges to appeal to all tastes. Nothing’s better than a chocolate fix after a long day at work, so why not give yourself an indulgent moment with a stunning keep-sake wicker hamper full of chocolate goodies? • Dreamy Desserts (192g) – this box of 16 chocolates includes all your dessert favourites: raspberry cheesecake, summer fruit cup, tiramisu, passion fruit mousse, pecan tart, lemon meringue, chocolate fudge cake and banoffee pie. My favourite from this selection was the banoffee pie. • Irresistible Gooey Caramel Melts (200g) – Does just what it says on the box – they’re irresistible and gooey and deliciously caramelly and they are ever so nice melting in the mouth. These didn’t last very long at all. Individually wrapped: this only means it takes a little longer to shove them all in your mouth as you have to slow down to patiently unwrap each one first. • Scrumptious Chocolate Cocktails (104g) – including Peach Bellini, White Russian and Strawberry Daiquiri. A grown-up chocolate treat. • Irresistible Nutty Praline Melts (200g) – so incredibly moreish, these didn’t last very long either once they were opened. No, not nearly long enough. How did the bottom of the box appear so soon? • 70% Deliciously Dark Chocolate Block (90g) – decadent and dark! Superb for slowly savouring each mouthful. • Thorntons Chocolate Liqueur 70cl – Think Bailey’s but chocolate flavoured. This goes down a little too well over ice! Retailing at £44-99 this hamper has something for every tastes. Our family certainly enjoyed it! My family has to put up with an awful lot with me being a food blogger – late dinners (cold dinners! ), complete recipe fails that I have to apologise for and hastily concoct a Plan B, hidden vegetables and weird and wonderful products to review. Sometimes we get sent something to review which makes them all smile like the cat that’s got the cream: this is one of those times. You can find Thorntons on Twitter and Facebook. They also have an online shop. Thorntons has ever so kindly offered one of my readers the chance to win an Indulgence Intimate Wicker Hamper of their own. Simply fill out the Rafflecopter entry form below. PLEASE NOTE: The contents of this hamper were correct at the time of photography. Thorntons reserve the right to substitute products of equal value. For your chance to win one Thorntons Indulgence Intimate Wicker Hamper RRP £44-99 enter using the Rafflecopter form below. Come back and tweet about the giveaway every day for more chances to win! This giveaway is open to UK mainland entries only. Entrants must be age 18 or over. The winner will need to respond within 48 hours of being contacted; failure to do this may result in another winner being selected. The prize is offered and provided by Thorntons. The prize is one Indulgence Intimate Wicker Hamper. There is no cash alternative and the prize is not transferable. Closing date is midnight on Monday 29 September 2014 and the winner will be announced that day. Don’t forget to visit Elizabeth’s Kitchen Diary giveaways page for more fantastic prizes! 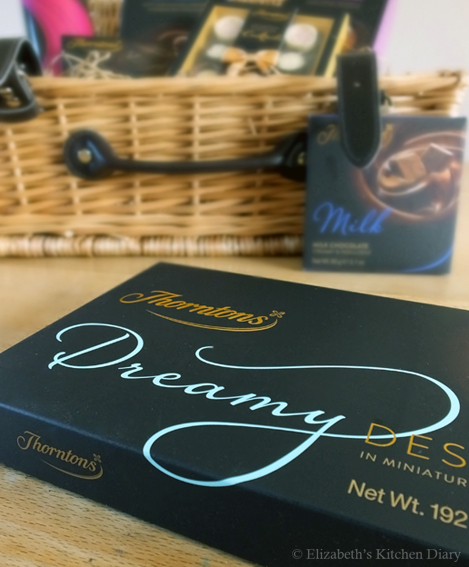 Elizabeth’s Kitchen Diary was sent a Thorntons Indulgence Intimate Wicker Hamper for review. All opinions expressed are our own. This is not a paid post. Coffee flavoured. I don’t even like coffee so not sure how that works. I love fruit flavoured ones. My favourite is the silician lemon- can’t get enough of it! i absolutly ADORE their mint selection. mint chocolate is the best EVER! I don’t know it’s name but it’s like a coffee truffle? SO DELICIOUS! Love the Sicilian Lemon bars – they are delicious! I love the dessert range of chocolates best. Peach bellini – to match my favourite tipple! Anything with strawberry in because it makes me think I am being healthy!! Milk chocolate covered toffee is my favourite. Emma Jackson recently posted…How to Help My Daughters Feel Beautiful? The Chocolate Cocktails one’s sound delicious! my favourites are Thorntons truffles! Most of them but the Lemon Mousse chocolate is the one!! Sicilian Lemon. Nom nom nom! i love all thorntons chocs but my favorite would hav to be the alpini bar – hazlenuts and almonds praline – whats not to love!! I have no idea what they are called but they are white chocolate with a delicious lemony centre! I love thorntons fudge!! yum! I love all of them, Thorntons is my word for Heaven. Their rum truffles are delish! Of course if I won, I’d save it all for Christmas. Yes indeed. I love the Champagne truffles, gorgeous! Praline melts do it for me! I love the Truffles, and the praline centres! I love the Thornton’s plain milk chocolate (especially when it’s in easter egg form!) but I am also partial to their champagne truffles. Got to be strawberry creams! I love Thornton’s Milk Chocolate and I’m very partial to their truffles! Anything praline works for me so definitely praline melts! Cappuccino is my favourite. Melts in the mouth. I absolutely loved their lemon and sea salt bar, but sadly it’s not available any more. Dark ginger is great. Galina V recently posted…Olé, olé, olives! Champagne truffles are my favourite. Thorntons are one of the only places I know that still do proper coffee cremes, I love them! When I pop up my local shop, I buy a small bar, usually a fudge/caramel one, somehow they seem more grown up! But I am salivating at the thought of the tirasimu and Bailey’s ones, mm-mmmm! I don’t know what my favourite is because I don’t get to try Thornton’s chocolates very often. It would probably be something along the line of orange or coffee. I adore the chocolate truffles,they are delicious. Rum or coffee truffles for me. Any of them! But I love the praline ones. Mmmm dark chocolate – the darker the better! WE love the chocolate coins they do at Christmas. Jackie Allum recently posted…Rock My Holiday Amadeus.Net! christine taylor recently posted…#Win 1 of 2 CBeebies Sweet Dreams with Squidge Musical Soft Toys. the amaretto truffles. yum diddly dum!! I love all the ones that come in The Desert Collection, so yummy! Champagne Truffles… cos I’m that kind of girl ! banoffee pie dreamy dessert – yum! Dreamy deserts sound soo good! Anything as long as it’s dark. Hellie’s Corner recently posted…Look What I Spotted!! The pralines are amazing definitely my fav! The Magnificent milk chocolate block. The nutty praline is amazing! Champagne truffles – utterly divine! Thank you, we did have a lovely day 🙂 I’d love to see a photo of the bouquet you made for your daughter, what a lovely thing to make! having trouble choosing here.love all their chocolates but at a push turkish delight. I love their marzipan coated in dark chocolate… drool. It has to be chocolate orange! the nutty praline is divine! Nutty Praline Melts – yummy ! I love their caramel and praline chocolates! I like anything with a cream centre! Lightly Salted Macadamia Chocolate Block is truly scrumptious! I love the praline chocs. I love their Irresistible Belgian Chocolate Truffles! Yum! Champagne truffles for me too! Love Sicilian lemon, so light; also the praline chocolates like Aplpini and Diplomat. I love the strawberry ones. Anything with hard caramel and dark chocolate. I can’t resist! I’ve finally managed to like dark chocolate so the 70% Dark Chocolate would be for me! My favourite are the Strawberry cream ones.They are delicious. Alpini – I must go in and buy one every time I walk past Thorntons! Zesty Lemon out the classics box,And Lemon Mousse out the other box.But to be quite honest i like all the fruity flavours. ooh difficult to choose only one – champagne truffles. Thortons toffee is my absolute fave-does no favours for my fillings though! the lemon mousse chocolates are lush! Chocolate truffles – very moreish! Turkish Delight has a slight edge, but I just love chocolate and Thornton’s is up there with the best. Love the Nutty Pralene Melts, scrumptious. 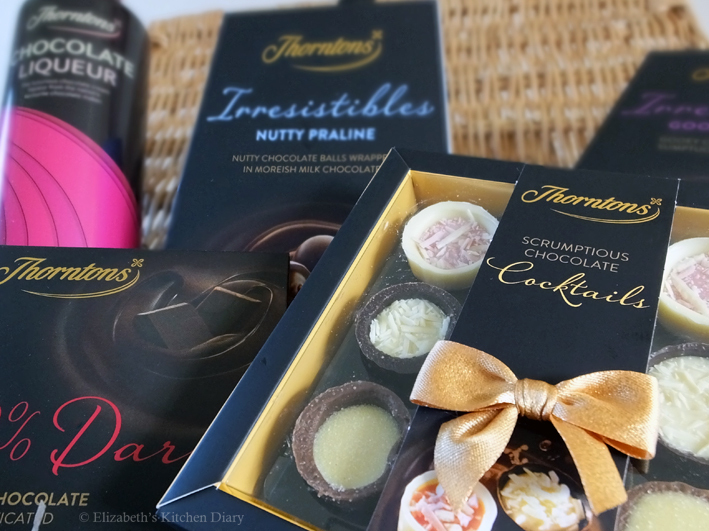 All Thorntons flavours are great – why pick just one? Nutty Praline Melts! Anything prailine is the best!!! Continental vanilla truffle – even though its 6.00 am I’m salivating at the thought! Banoffi pie- but I haven’t tried the cocktail chocolates yet! ALL OF THEM!!!!! I LOOOVE ALL OF THEM!!! The vanilla flavoured ones, never shared ! i love their tablet that they do, and they use to do chocolate covered pretzels which were so tasty! I love their nutty Alpini bars. Anything with a liquore gets my vote….ps I’m just awful at spelling, I haven’t been dipping into the chocolates yet today! I love the Thorntons chocolate covered toffee, wife loves the coffee crèmes! Heather Haigh recently posted…Review – I love this Mason Cash Pestle and Mortar! Milk Chocolate and anything with fruit cremes! Sicilian Lemon bars are heaven! Their Continental Champagne Truffle is my fave. I love the marzipan bars! I like their white chocolate! Any of the praline chocolates! I could really do with some right now ha. Haven’t had thorntons for ages but love the diplomats, chocolate Brazils and cookies. Listed them all as couldn’t chose a favourite. love good old milk chocolate! It’s chocolate – how could I possibly pick just one favourite? I love the dark chocolate block. The Cappuccino bar – yummy!! I liked that one too – and this hamper IS amazing! So yum! I love the truffles best, all flavours. The Vietnamese truffles are absolutely gorgeous! the praline melts are delicious!! Their vanilla truffles are my favourite. The dreamy desserts, especially the lemon meringue flavour. It is divine. I love this prize! Would love to experiment with the liqueur and I love all of Thornton’s nutty chocolates and truffles. coffee creams are my fave! Love all of them, but the White Russian and Strawberry Daiquiri, is the first one I go for. I also have to say the dreamy desserts is the best collection too. I love the 70% Deliciously Dark Chocolate Block – so satisfying! Praline melts, they are suspiciously addictive. Truffles are the best!! Who doesn’t love chocolate!!!!!!!!!!!!!!!! Anything cherry flavoured. Or their white chocolate. Yum. The Irresistible Smooth Coconut Melts. From the desserts collection – Lemon Meringue. The Dark Ginger is my favourite flavour Thorntons chocolate, though the Mint Crunch, Dark Chilli, Dark Espresso and 70% Deliciously Dark are also gorgeous. Along with all the other entrants, I will be keeping my fingers crossed hoping for a little bit of luck to come my way now as this prize would be perfect for sharing with my nearest and dearest. I like all of the cocktail flavoured one’s! Either champagne truffle or apricot parfait depending on my mood. I’d not turn down any of them though! All of them! Their hot chocolate is the best! Continental range – I love all of them. Continental Sicilian Lemon Mousse, I also love their fudge. Kat (The Baking Explorer) recently posted…Chocolate & Lime Swiss Roll: GBBO Season Five Begins! EEK! How can you make me choose one chocolate over another? It’s Sophie’s choice! But if you force me, I’ll probably choose Thornton’s Turkish Delight, but I need to add to the rest that I love you all. Coffee creams covered in heinie chocolate! White choc, coconut and lime. The dark chocolates. The darker the better. What a beautiful quotation! I love pralines. I don’t have a favourite flavour I just like thorntons chocolate in general. I love the coffee creams. My favourite is an Alpini, yummy, a classic. I love the lemon mouse chocolates delicious! Their dark chocolate is to die for! I love their chocolate fudge, yum yum! Classic Coffee Creams, so yummy!! I love the vanilla truffles. Champagne truffles! Yeah, I know I have expensive tastes! Where do they send it to?! I miss thorntons so much! I’ve always loved their champagne truffles! All the dark chocolates – especially with marzipan or anything almondy. I hear you! Toffees have long since been omitted from my diet! Has to be the Viennesse Truffle! I love thorntons champagne truffles they are amazing!! They used to do a cappucino bar that I loved but I don’t think they make it any more! I have never tried it, but i’m sure the White Russian flavour would be my favourite. Definitely the praline melts, especially as my husband is allergic to nuts – I get them all to myself! I love their dark chocolate!! Champagne truffles for me – delicious!! Their irresistible Nutty Praline Melts! Dark Ginger Chocolate Block – very difficult having to make a choice! The Praline melts take some beating. I love the viennese chocolate bars. So dreamy. I like the truffles that they sell. I love the one’s with fruit centers…..The Chocolate Cocktails one’s sound delicious!! Love their Continental chocolates – all of them!